U.S. financial regulations on data retention do not fit with the way people expect to communicate on social media, Fidelity Investments Chairman Abigail Johnson said on Tuesday. “The real issue is a regulatory regime that doesn’t fit with the way people communicate today,” said Johnson, who runs the financial services company that manages about $2.3 trillion in assets. Johnson made her remarks in a speech at a conference hosted by the Securities Industry and Financial Markets Association (SIFMA) in Washington. Johnson called for modernization of the policies around social media data retention. A shortage of nurses at U.S. hospitals hit West Virginia’s Charleston Area Medical Center at the worst possible time. The United States started to deploy the first elements of its advanced anti-missile defense system in South Korea on Tuesday after North Korea's test of four ballistic missiles, U.S. Pacific Command said, despite angry opposition from China. The announcement came as North Korean state media said leader Kim Jong Un had personally supervised Monday's missile launches by an army unit that is positioned to strike U.S. bases in Japan, stepping up threats against Washington as U.S. troops conduct joint military exercises with South Korea. 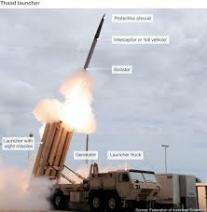 "Continued provocative actions by North Korea, to include yesterday's launch of multiple missiles, only confirm the prudence of our alliance decision last year to deploy THAAD to South Korea," U.S. Pacific Commander Admiral Harry Harris said in a statement, referring to the Terminal High Altitude Area Defense (THAAD) anti-missile system. The four ballistic missiles fired by North Korea landed in the sea off Japan's northwest, angering Seoul and Tokyo, days after Pyongyang promised retaliation over the military drills that it sees as preparation for war. "Japan and the U.S. confirmed that the latest North Korean missile launches were clearly against U.N. resolutions and a clear provocation against the regional and international community," Abe told reporters. "(North Korea's) threat has entered a new phase." Trump also spoke to South Korea's acting President Hwang Kyo-ahn to discuss the North's missile launches, Hwang's office said. More than 61,000 people fleeing persecution and violence may have their applications to come live in the United States delayed, according to refugee resettlement charities. President Donald Trump issued a new executive order today, suspending America’s refugee resettlement program for 120 days and halting travel to the United States from six Middle Eastern and North African countries for 90 days. During that time, federal agencies are supposed to review the traveler and refugee vetting process. The new order affects more than 50,000 refugees who have been approved by the Department of Homeland Security to come into the U.S., but haven’t yet booked their travel, according to Church World Service numbers. They will now have their applications temporarily frozen. “It really grinds the program to a halt because refugees only have a two-month travel window,” Smyers says, “so a four-month suspension means that every single person is going to see at least one security check expire.” Re-doing expired checks may take folks years, Smyers says. In addition, more than 10,000 refugees have booked their flights to the U.S. and will need to make it into the country before the new executive order takes effect on March 16th, or they’ll risk delay, as well. Not all of the affected are citizens of the six countries — Syria, Iran, Yemen, Libya, Sudan, and Somalia — that the Trump administration has deemed especially dangerous. About 7,000 are from Myanmar; about 9,000, from the Democratic Republic of the Congo; and nearly 10,000, from Iraq, which Trump removed from his original travel ban list because of “the close cooperative relationship between the United States and the democratically elected Iraqi government” and “Iraq’s commitment to combat ISIS,” according to the new executive order. About 31,000 affected refugees come from the six nations that are under the travel ban. The U.S. has already settled about 37,000 refugees in this fiscal year, which began in October. Trump has set a limit of 50,000 new refugees for fiscal year 2017, after the Obama administration had promised 110,000 could come. 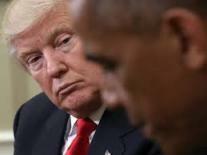 · President Donald Trump said he believes that predecessor Barack Obama is riling up protesters against his administration and that Obama’s “people” may be the source of unflattering national-security leaks to the media. · “I think he is behind it. I also think it is politics, that’s the way it is,” Trump said of the protests during an interview with the hosts of “Fox and Friends” conducted Monday at the White House and aired Tuesday. · Trump didn’t offer any evidence of Obama’s direct involvement. Obama’s Organizing for Action, the nonprofit group that was formed after his 2012 campaign, is one of the many organizations supporting protesters who are challenging the new president and congressional Republicans. The organization paused its activities during the 2016 race. President Donald Trump's campaign promise for a $1 trillion infrastructure program will be in focus when U.S. governors gather on Friday in Washington, D.C., with some states making wish lists of projects ranging from a bullet train to statewide broadband internet service. The winter meeting of the National Governors Association running through Monday is expected to showcase rare bipartisan agreement on the need for more federal help in upgrading roads, bridges and airports, said Scott Pattison, the group's executive director. "There's just this pent-up demand to deal with, whether it's a crack in a dam, a bridge, whatever it is," Pattison said in a telephone interview. Although there is little movement on Capitol Hill to make Trump's infrastructure vow a reality, governors have sent the White House a list of 428 projects they say are ready to go with some extra federal spending. The National Governors Association has not released the list but checks with some states hinted at the projects. Democratic California Governor Jerry Brown has asked for $120 billion, saying that since the state made up 12 percent of the U.S. economy it deserves 12 percent of Trump's $1 trillion package. "We're not talking about a few million, we're talking about tens of billions," Brown said of the infrastructure proposal this month as he sought federal aid to deal with a leaking dam and flooding. Among California's big-ticket items is construction of a high-speed rail system linking San Francisco and Los Angeles. Colorado and Minnesota want help building statewide broadband systems, with Minnesota Governor Mark Dayton, a Democrat, saying his state needs $150 million for its broadband grid. Republican Kansas Governor Sam Brownback's top priority is $122 million for interstate highway repairs. South Carolina and Virginia want federal aid to deepen ports, among other projects. In a letter to Trump, Republican Governor Henry McMaster said South Carolina also needed help replacing roads and bridges. "An appropriation of $5 billion from your infrastructure plan will help us bridge this economic gap," he wrote. Pattison said governors wanted a "toolbox" of financing options, including municipal bonds, cash, public-private partnerships and federal matching funds. The governors are scheduled to meet with Trump on Sunday evening and again on Monday morning. One of the speakers at the governors' conference, Leo Hindery, a managing partner at New York's InterMedia Partners, will tell state executives that creating a federal infrastructure bank is the only way to fund the hundreds of billions of dollars needed for public works. The United States has long been criticized for its lagging public works spending. The American Society of Civil Engineers has graded U.S. infrastructure at D+ and estimated the country needs to invest $3.6 trillion by 2020. During his campaign, Trump said he wanted action on infrastructure in his first 100 days as president. That now seems unlikely. He also talked about creating a tax credit to encourage private sector investment. Trump’s plans to create an infrastructure council have yet to get started. Republican lawmakers have said they expect to get White House infrastructure proposals but have given no details or timing. Scotland’s first minister, Nicola Sturgeon, has said that Donald Trump’s UK state visit ought to be cancelled while travel bans are in place as she called on the prime minister to speak up more strongly against the values that the US president’s policies have exposed. Speaking after a one-to-one meeting with Theresa May that took place before the meeting of the joint ministerial committee in Cardiff, Sturgeon said she told the prime minister she should voice concerns about Trump more forcefully. The Scottish National party leader told the Guardian: “I said that while everybody understands that she wants to build a constructive relationship, that relationship has to be based on values. I think many people would like to hear a stronger view from the UK government about the immigrant and refugee ban that was announced. Asked if May had been too quick to travel to the US to meet Trump, Sturgeon said: “She’s the prime minister of the UK. Everybody would understand she wants to build a positive relationship with the president of the United States. As first minister of Scotland I want to build a constructive relationship with the new administration. I’m not criticising her for that. But relationships have to be based on values. “We’ve all got a duty to speak up for fundamental values. There’s a real concern on the part of many that introducing what is seen by many as a ban on Muslims, banning people because of their origin or faith, is deeply wrong and likely to be counterproductive in terms of the fight we all have an interest in against extremism and terrorism. New U.S. ambassador to the United Nations, Nikki Haley, pledged on Friday to overhaul the world body and warned U.S. allies that if they do not have Washington's back then she is "taking names" and will respond. Haley made brief remarks to the press as she arrived at U.N. headquarters in New York to present her credentials to U.N. chief Antonio Guterres. "For those that don't have our back, we're taking names, we will make points to respond to that accordingly," she added. U.S. stocks lost ground on Monday as investors digested President Donald Trump's protectionist statements and sought safe-haven assets such as gold and U.S. Treasury bonds. Trump, who met with a dozen prominent American manufacturers at the White House, said he would slash regulations and cut corporate taxes to boost the economy. He, however, reinforced his stance of putting "America first" by warning manufacturers of penalties if they moved production outside the country. The Trump trade, which led Wall Street to repeated highs since the election, has unraveled in recent weeks as investors fret about the potential impact of his isolationist stance on world trade and the lack of clarity on his policies. "I think the market wants to see more definitive statements like how healthcare and tax reforms get played out, so there is no reason for it to be excited," said Robert Pavlik, chief market strategist at Boston Private Wealth. At 10:55 a.m. ET (1555 GMT), the Dow Jones Industrial Average .DJI was down 65.9 points, or 0.33 percent, at 19,761.35, the S&P 500 .SPX was down 9.93 points, or 0.43 percent, at 2,261.38 and the Nasdaq Composite .IXIC was down 22.81 points, or 0.41 percent, at 5,532.52. Trump has made it clear that he plans to hold talks with leaders of Canada and Mexico to renegotiate the North American Free Trade Agreement (NAFTA) and intends to withdraw from the 12-nation trade pact of the Trans-Pacific Partnership. The dollar .DXY hit a six-week low on Monday, while prices of safe-haven gold rose for the third straight day. Oil prices fell about 1 percent on signs of strong U.S. drilling activity. The S&P energy index .SPNY hit its lowest level since Nov. 30. Eight other S&P sectors were also lower. Safe-haven stocks utilities .SPLRCU and real-estate .SPLRCR were the outliers. Qualcomm (QCOM.O) dropped 13.4 percent to $54.44 after Apple (AAPL.O) filed a $1 billion lawsuit against the chip supplier on Friday. Qualcomm was the biggest drag on the S&P and the Nasdaq, while Apple's stock was flat. Halliburton (HAL.N) fell 3.4 percent after the world's No. 2 oilfield services provider reported a bigger loss in the latest quarter. Billionaire Wilbur Ross, chosen by Donald Trump to help implement the president-elect's trade agenda, earned his fortune in part by running businesses that have offshored thousands of U.S. jobs, according to Labor Department data attained by Reuters. The figures, which have not previously been disclosed, amount to a small fraction of the U.S. economy, which sees employment fluctuate by the tens of thousands of jobs each month. But Ross's track record clashes with Trump's promise to protect American workers from the ravages of global trade. Recently, Trump claimed credit for saving 800 jobs at a Carrier Corp. factory in Indiana, even touring the plant to shake hands with employees. He has targeted Ford Motor Co (F.N) and other automakers to keep hundreds of jobs inside the U.S. borders. That disconnect could draw attention at his hearing, one of many scheduled this week for Cabinet nominees ahead of Trump's Jan. 20 inauguration. "He is not the man to be protecting American workers when he's shipping this stuff overseas himself," said Don Coy, who lost his job at the end of 2016 when a company Ross created - International Automotive Components Group - closed a factory in Canton, Ohio and shifted production of rubber floor mats to Mexico, eliminating the final 16 jobs in a factory that once employed 450 workers. Ross did not respond to several requests for comment. His offshoring activities are not unusual in an era when globalization has lowered international trade barriers. Auto-parts maker Delphi Corp., for example, has offshored 11,700 U.S. jobs since 2004, while textile makers have offshored at least 17,000 jobs since then, the Labor Department said. "When Ford offshores new production facilities to Mexico, that both boosts the Mexican economy and reduces investment in this country," he wrote in September in a Washington Post opinion piece penned with Peter Navarro, another Trump economic adviser who has been tapped to direct a White House trade council. In a bid to reverse offshoring, Trump has threatened to impose "a big border tax" on automakers that choose to build cars in Mexico rather than the United States and has talked of resetting free-trade deals such as the North American Free Trade Agreement (NAFTA). A Trump transition spokesperson said personnel decisions at Ross's auto-parts and textile companies were driven by the need to put operations near customers and keep U.S. plants competitive, echoing arguments made by other auto industry executives who face pressure from Trump. "Few people have done as much to defend American jobs and negotiate good deals for American workers as Wilbur Ross," said the spokesperson, who asked not to be named. The offshoring figures for Ross's companies came from the Labor Department's Trade Adjustment Assistance (TAA) program, which provides retraining benefits to some workers who lose their jobs due to outsourcing or cheap imports. The program does not cover everybody who is hurt by global trade: service-sector workers were not eligible until 2009, and those who don't apply for the program don't show up in its records. Despite Trump's campaign rhetoric about countries like Mexico and China taking U.S. jobs, the TAA figures show globalization has claimed fewer jobs in recent years. The program covered roughly 80,000 workers last year, down from about 340,000 in 2009.